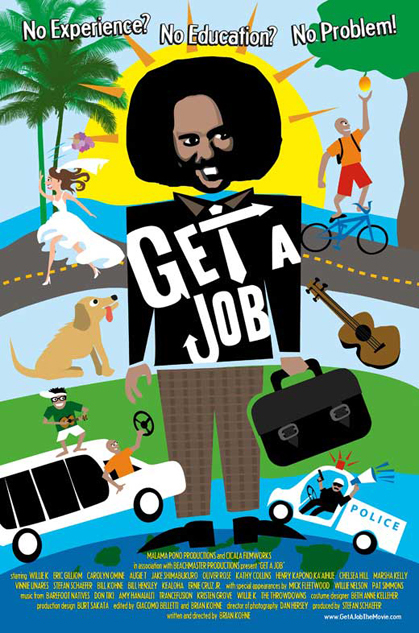 GET A JOB features 24 original songs. Director Brian Kohne built the movie around the soundtrack. The full feature stars Willie K and Eric Gilliom. They are two friends attempting to find the dignity of employment while bumbling through life and sharing the Aloha Spirit in Hawaii. Funny experiences enhance their journey while they share their special musicality and hilarious charms. They are backed up by world-class entertainers such as Mick Fleetwood, Willie Nelson, Pat Simmons of the Doobie Brothers, Henry Kapono, Carolyn Omine, Kathy Collins and Augie T. Jake Shimabukuro plays a mean ukulele in the tourist scene. Kohne, who has Ohio roots, shows why he is such a creative force by blending the music seamlessly. GET A JOB will showcase Sunday August 14th and screen at 3:35 p.m. on Sunday, August 14th in screening room C. One of the producers, Raymond Rolak, will be on hand to do a Q & A after GET A JOB shows. Rolak is an expert on attracting product placement, even for shorts. The awards will close out the festival on Sunday, August 14th at 5:15 p.m. in the main ballroom. Other special attractions are the FX special effects competition and the fight scene choreographic competition. Veteran director Gary Jones will be in attendance as will Halloween personality Jason MCcallister as Skippy the Evil Clown.